Post Rentals to the area category. Elegant, glittering 4,000 sq. ft. open studio event venue. Bar and Bat Mitzvahs, Sweet Sixteens and Quincea�eras. VIP Exclusive is affiliated with the most luxurious establishment in the VA DC MD area! We can host any special occassion. Movement arts venue for dance classes, rehearsals, performances and private events. Has the historic facade of the old Ideal Movie Theater. An Event Venue offering the entire facility or individual rooms for private parties, wedding receptions, business meetings, classes, auditions, birthday parties, etc. Call 410-828-6116 for details. The main ballroom is 35′ X 80,′ other rooms are 20′ X 38′ and 14′ X 30′. 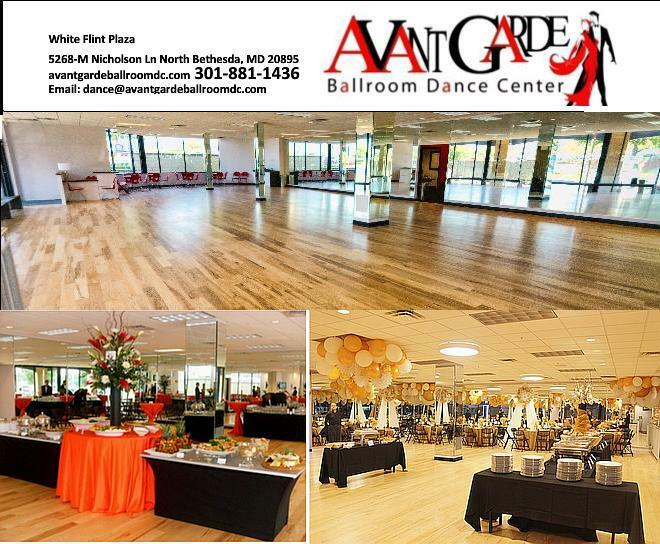 Avant Garde Ballroom lends itself nicely to a variety of special events including: wedding receptions, rehearsal dinners, birthday celebrations (Sweet Sixteens, Bar/Bat Mitzvahs, Quincea�eras,etc. ), anniversary parties, graduation parties, fundraisers, and more. Please don't hesitate to contact us if interested. Gogo Guru studio is available to rent for private classes, trainings or non-medical appointments. The regular rate is $40/hour, and includes set-up and clean-up time. Beautiful dance floor and mirrors. $45 per hour. The studio has a large rental dance hall which has a capacity of around 175 ppl. We have surround sound system, capability to dive rooms into 2, has a kitchen and bar area, has tables and chairs available, a reception area & registration area. FREE Parking ALL around the building is available too. Kitchen, walk-in refrigerator, serving bar, alcohol licenses avail. 2200 sq foot floating floor, Available M-F until 4 after 8:30PM, Sunday until 7PM Sat 2-7. Call for availabiltiy. $30/hr for Ballroom Dance shoes/heels with covers only. 4920 St Elmo Avenue in Bethesda, Maryland, just 2 blocks NW of the Bethesda Metro. Parking is available in the St Elmo Ave Garage just across the street. Parking is free on weekends. Rental arrangement can be daily, weekly, monthly, yearly. Call 202-210-2238 for more information. Ballroom and a pavillion (with sides) for rent. The ballroom is 100'x65', stage, springboard hardwood floor, 2005 sound system and is available year-round depending on availability. The pavillion is 96'x48', hardwood floors, stage with great sound system and is available year-round depending on availability. Our facility has 2 spacious studios under one roof. 1300sq. ft & 800 sq ft. of nothing but dance space. It is located 10 minutes from the beltway and we have off street parking no meters. We also have ebony marble tile, dressing room, bathroom, garage entrance to load and unload for your convience. We have 2 stereo sound systems with 3CD & 5 CD Changers & dual cassette tapes. Also a record player w/ dual cassette tape. Full access to karoake machine with lots a selections to choose from for your event as to state of the art microphones. We also have seasonal decorations to choose from as well. 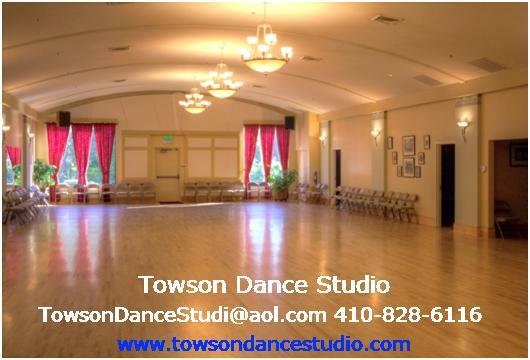 Three studios available the Liz Lerman Dance Exchange studios in Takoma Park � two blocks from the Takoma Park Metro. The space is geared for workshops, rehearsals and classes, and is available for one-time or ongoing use. Comments: For use of the facilities, call (301)588-3303. 20's Style theme new hard wood floor, new sound system and reasonable prices. We offer complete rehearsal setup needs, with all necessary equipment to rehearse. Climate controlled enviroment and plenty of free parking. DC area...5 minutes from University of Maryland...10 minutes from DC. Beautiful Dance/Acting studio space. Floating Hard Wood Floor, Mirrored Walls. 900 square ft. Absolutely gorgeous space to awaken, engulf, embrace and EVOLVE the craft! North of East-West Highway and next to the Chevy Chase fire station. Large meeting room with a stage. Clean Studio space with high ceilings. Well air-conditioned. 5 private rooms, mirrored and equiped with sound systems. Main floor is about 1,500 Sq. feet. All wood floors, and are in good condition. Available (7) days a week.Times are very flexible. Please conttact us for pricing and availability. Ballroom, Banquets, Pavilion for Outdoor Events. 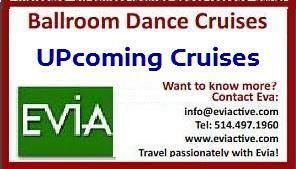 Hosting a variety of dance events on a regular basis open to the public. Rental of floor space to independent professional ballroom dance instructors for private and group instruction and to established amateur and professional dance organizations for dances, classes and other events. 1600 square foot wooden dance floor and state-of-the-art sound system. Event Venue is a 3500 sq ft open ballroom with a state of the art sound system and full kitchen. Party planners and caterers available. Approximately 40 parking spaces on site. Event Venue for dances, wedding receptions, meetings, and social events. beautiful warehouse conversion great place for privates, classes, fitness, small venue performances. Complete sound system with stage type lighting. great for impromtu acts, host parties etc......cheap for dance, fitness classes to rent. Dance studio available for practice space, private lessons, rehearsals, and workshops. Studio has cushioned dance floor, as well as parking lot and garage parking available. We rent two beautiful large dance studios with hardwood floors, large wall to wall mirrors, free parking, sound systems, grand piano, kitchen. BalletNova Center for Dance offers 6 state-of-the-art dance studios with sound systems, sprung floors, and mirrors. The largest is 2500 sq. feet available for practice, classes, rehearsals and special events. Partial kitchen is onsite. Also dressing rooms and waiting room space. Looking for space? Ballet Petite McLean has 5 studios with mirrored walls, sprung floors (wood or marely) & ballet baares. Rent space for dance classes, jazzercise, Pilates, yoga or other various needs. No street shoes are allowed in the studio. Rentals are set up on a contract basis. $25 per hour for private classes. $45 per hour for group classes. Private studio space in Northern, VA.
Garry Gekhman's (formerly Craig Hutchinson's) Falls Church Home Studio is available to teachers, couples and small group classes, practice space. Comments: Multi-use-event facility with restaurant and nightclub/dance hall. Dance Studio Lioudmila is a First Class dance facility. 4000+ Sq. Ft. oval hard wood floor is the largest in the Washington DC Metropolitan area! New Dance Floor Rental Rates!! In the historic City of Fairfax. Available for wedding receptions, social functions, business meetings etc. Classic public assembly hall, great for private parties. Upper level has hardwood floors, and an elevated stage, perfect for small recitals and performances. The Great Falls Grange may be reached by taking Beltway Exit 44 west (Georgetown Pike, Route 193 west) for 6.2 miles to the park entrance on the right. 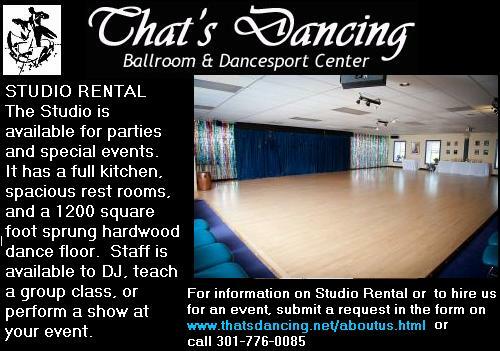 Beautiful, clean, 2 studio dance facility located in Sterling, VA available for rental. Sprung dance-surface floors, barres, fully mirrored, excellent parking. Call Lisa at(703) 318-9770. 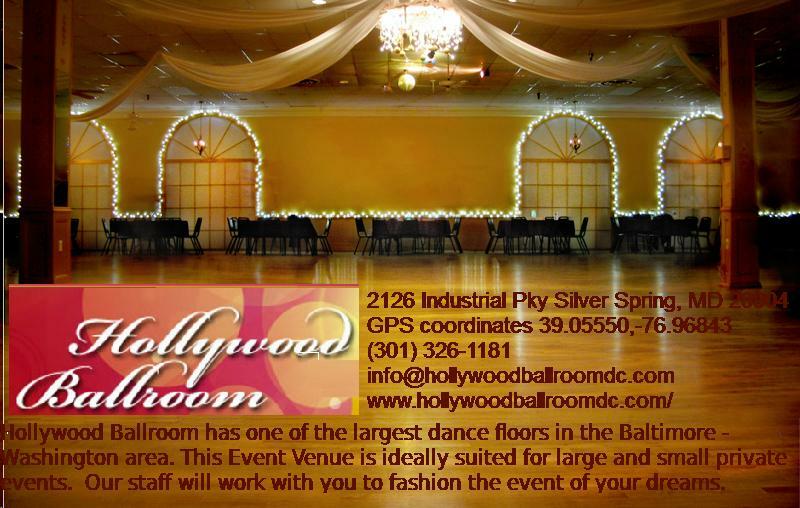 Comments: Ballroom available for private parties and dance competitions. Comments: AM Legion Post 364 has a very large floor to be able to dance the Smooth/Standard easily. Small Urban style dance studio for lease by the hour in Knoxville, TN. Great for small dance classes, private lessons, fitness classes, birthday parties and more. DuraDance wood floor with padding, full mirrored wall, disco lights, waiting area, reception area and great sound system. Check out our website for more information and photos. 10,000 square foot building with 5 classrooms 2 classrooms open into one large. All dance rooms have free floating floor system.Great music system in each room. Plenty parking. Easy access from 540 & 440.